Be the first to share your favorite memory, photo or story of Delores G. "Dee" (Sanger) . This memorial page is dedicated for family, friends and future generations to celebrate the life of their loved one. 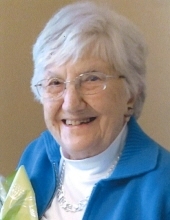 Delores G. "Dee" (Sanger) Pohle, age 97 of Windsor, WI, formerly of Lancaster, passed away peacefully on Monday, February 4, 2019, at UW Hospital in Madison, WI. She was the daughter of Lou and Chloe Sanger of Lancaster, WI; the wife of William "Bill" Pohle, who predeceased her in 2003; the mother of Cinda (John) Schindler of Lancaster, WI, Michael Pohle of West Des Moines, IA, Anne (Ward) Meyer of Windsor, WI, Polly (Jim) Hauser of Dubuque, IA, and Martha "Marcy" Thronson, who also predeceased her in 2003; the grandmother of 10; and the great-grandmother of 14. The oldest in a family of five, Dee outlived her siblings (Kate Holzinger, Barney Sanger, Arlene Sutliffe, Archie Sanger) and her brother-in-law (Elmer "Slim" Pohle). She was also predeceased by her father-in-law (Elmer Pohle) and her mother-in-law (Martha Pohle). In many ways, Dee was a traditional daughter, farm wife and mother. She was a good student, supportive wife, and loving mom. She worked tirelessly, doled out equal parts praise and discipline, and pragmatically overcame the disappointments and challenges that came her way. She also gave back to her community through countless activities, helped care for her parents and mother-in-law as they aged, and was ready with sage advice for her children when requested. In other ways, Dee was a unique individual and early feminist. During WWII, she ventured to Washington, D.C., as a single woman to work for the U.S. Department of Labor. As an equal partner to her husband, Bill, she participated in farm and business decisions. Together, they ran the Blake's Prairie Fair in Bloomington, WI, for 10 years. In 1969, she took a job with the Bloomington Record, where, for the next 10 years, she sold advertising and penned her "Dabbles by Dee" column. In true renaissance fashion, she took up painting, quilting, golf and bridge in her mid-60s. She gave her children room to succeed or fail on their own terms and led by example. Dee loved to dance, play cards and garden. She enjoyed a good laugh and the company of good friends. She exhibited courage when her husband and daughter died within a month of one another. She aged gracefully and often stated her amazement at her life of adventure, love, good fortune, and so many happy memories. She felt blessed, as does her family. A tribute to Dee's life will be held at a later date. The Martin Schwartz Funeral Home of Lancaster is assisting the family. To plant a tree in memory of Delores G. "Dee" (Sanger) Pohle, please visit our Tribute Store. "Email Address" would like to share the life celebration of Delores G. "Dee" (Sanger) Pohle. Click on the "link" to go to share a favorite memory or leave a condolence message for the family.